Apple has released iOS 10.2.1 to users worldwide. The update brings a number of security and stability improvements and bug fixes. There are no new features or design tweaks in the update. Apple has fixed a number of bugs that could be used by hackers to steal user’s data from iPhones, iPads, and iPod touch units. You can get more details about the security enhancements of the latest update at link. 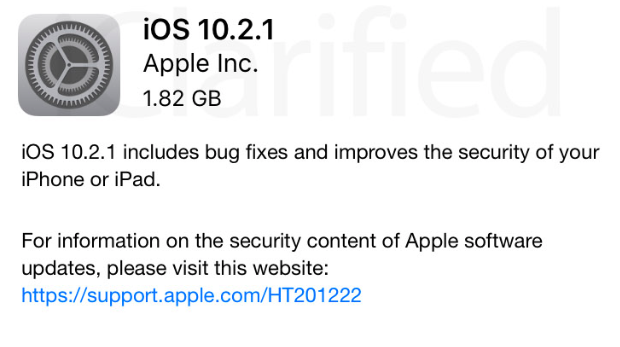 iOS 10.2.1 is compatible with iPhone 5 or newer, iPad 4, iPad mini 2 or newer, iPad Pro, and iPod touch. It is recommended that all users update to this firmware version. The developers started testing iOS 10.2.1 on December 14th, so hopefully, there are no serious issues with the final build. We’ll let you know if we find anything interesting in the latest update.